Mulderbosch Vineyards are located in the prime Koelenhof area of Stellenbosch, South Africa, an area well-known for its rich soil. The farm land that housed Mulderbosch was bought in 1989, cleaned up and then planted by legendary winemaker Mike Dobrovic. Chardonnay, Sauvignon Blanc and Chenin Blanc varietals were planted. After a few vintages, local wine guru John Platter proclaimed his belief in Mulderbosch wines, especially the Sauvignon Blanc, thus putting Mulderbosch and their wines on to the world stage. In due time, the stylish Sauvignon Blanc that winemaker Mike Doborvic developed won worldwide acclaim and a name for Mulderbosch wines. In 2009 the vineyard was sold and winemaker Mike Dobrovic moved on, making room for group cellar master, Richard Kershaw, to take over the helm. Today, Charles Banks, known for his ‘cult classic’ Screaming Eagle, a California Cabernet, and his investing group, Terroir Capital, recently purchased Mulderbosch in June. Their plans are to take this wonderful wine to greater heights. The wines have been imported into the United States for the past 20+ years by well-respected South African importers, Cape Classics. When I was in wine sales, many years ago, I often led my customers to Mulderbosch wines. I knew if they liked the wines, they would have no trouble remembering the label, as it is put onto the bottle vertically. As a wine retailer, repeat business is the name of the game. Customers rarely remember the label of a bottle of wine they purchase. In the case of Mulderbosch, the label is what they remember, along with the high quality of the wines (all under $20). 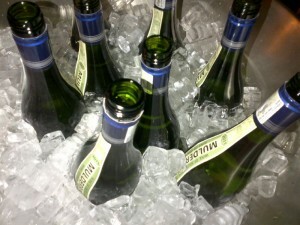 The new owners recently held a media tasting of their wines, to reacquaint us with Mulderbosch wines. The results were universally positive, as these wines are in fact exceptional food pairing wines. We were served BBQ plus South African food specialties, including desserts. Chenin Blanc Steen Op Hout: Mulderbosch has the largest planting of Chenin Blanc in the world. This wine is a ‘classic,’ known for its natural acidity. 20% of the wine is aged in oak barrels for five months. Mulderbosch Sauvignon Blanc: Known for its cut grass and gooseberry profile, this Sauvignon Blanc deserves the numerous 90 point ratings it receives. Mulderbosch Cabernet Sauvignon Rose: This is my favorite Mulderbosch wine. Its high acidity combined with fruit aromas makes this rose special. The grapes are grown specifically for rose, thus creating notes of cedar, tar and cherry wood. Add barrel aging and flavors of cassis and blackcurrant take over.